Cream shortening; add brown sugar and molasses and mix thoroughly. Continue mixing while adding water, salt, allspice, ginger, cloves, and cinnamon. Add the baking soda to the measured flour and stir into mix. Dough will be very firm, so if your mixer begins laboring before all the flour is added knead the remaining flour in by hand. Place dough in plastic bag, squeeze out all the air and chill for a minimum of 24 hours, can chill up to 48 hours to 1 week before using. Bake in a pre-heated oven 350 degrees for 7 to 8 minutes or until edges start lightly browning (10 to 12 minutes). Roll dough out onto parchment paper, not waxed paper. Cut pieces leaving enough space around each piece. Use pizza cutter for straight edges, exacto knife for curved pieces. Don’t remove excess gingerbread until you have scored all pieces as it can cause pieces to move. Slide parchment paper with cut dough onto cookie sheet. Slide parchment paper and cooked pieces onto counter, let cool 1 minute, place clean parchment paper on top and flip over, place cookie sheet with books on top to keep pieces from curling. Let pieces cool completely. Don’t use wire rack to cool pieces will cause them to curl and cause lines. Let pieces dry for 24 hours uncovered. Can bake well in advance of building gingerbread house, extra drying never hurts. Put egg whites in mixing bowl; then powdered sugar and cream of tartar. Mix on low until blended. Once blended, switch to high speed and mix for 6 minutes. Icing will turn very white and stiff. Icing can be kept in air tight container for up to 2 days in refrigerator. When storing Royal Icing, place plastic wrap directly on top of icing, pushing all the air out, then cover. Whip icing that has been stored to bring back stiffness. If icing is to dry add more egg whites, if too wet add more powdered sugar. Wrap piping ends with damp paper towel between decorating to prevent hardening. Use canned goods or other pantry items to help stabilize walls during assembly; remove after icing is dry. May need extra hands when adding the roof. Allow house to dry completely before adding decorations –minimum 4 hours. Use a rubber band on the top of your pastry bag to keep icing from oozing out. Cuff bag top over one hand while using your other hand to scoop in icing with spatula. Don’t fill bag more than ½ way full of frosting. Unfold cuff and twist top of bag closed, forcing icing down into bag and decorating tip. Release air bubbles before decorating by holding bag over icing bowl and squeezing until air is released. Have a plan. How, where will house be positioned? Make sure base is large enough and will carry the weight of your structure. Visualize the “yard”, where will the walkway go? Trees? Fence etc. To make roof tiles for your Gingerbread house, run a line of frosting across the bottom edge of your roof. Place the first row of crackers/candy at the bottom edge of your roof. For the second row, offset the “shingles” by starting with 1/2 a “shingle”. Continue until your roof is covered. When decorating, be careful not to put too much weight on your roof. 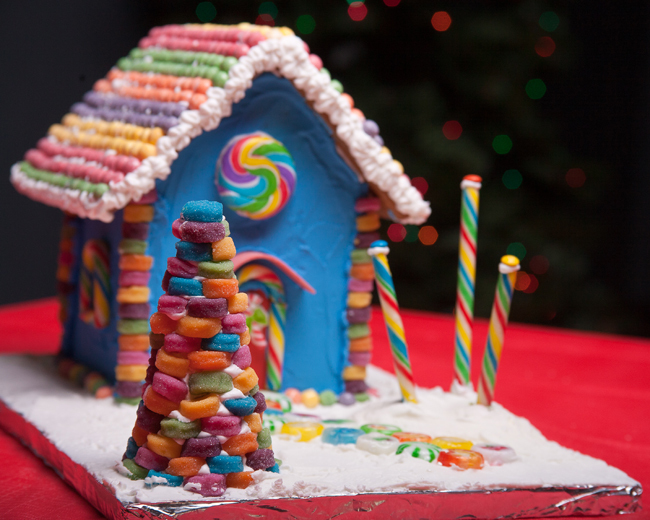 Heavy candy or too much frosting could cause your roof to cave in. Frost roof and sprinkle with candy sprinkles, coconut, cocoa, etc. An easy way to create a path or walkway is to spread a good amount of frosting in the shape of your path or walkway. Now press the candy into the frosting. The frosting will fill-in around the edges, forming a mortar between the candy. When tinted green, with a variety of cereal added for shape, and optionally coated with Corn Syrup for a glossy look, you can have edible, uniquely shaped bushes and trees. Melt butter in large saucepan over low heat. Add marshmallows and stir until completely melted. Add dark green food coloring. Cook over low heat for about 3 minutes longer, stirring constantly. Remove from heat. Add your choice of cereal. Stir until well coated. Let cool for a minute or so (but not too long or it will harden in the pan). WITH YOUR HANDS COATED WITH BUTTER or MARGARINE (so the mix won’t stick to hands), scoop out the amount you want and form into bush or tree. You have to work fast. It also helps to place bushes on a glob of frosting so they will stick to the “yard”.